After several requests and considerable delay, assistant City Attorney Reed Gallogly finally coughed up the recent additions to the SCPD Policy Manual. I previously posted the full manual as of 2011 at http://www.indybay.org/newsitems/2012/05/19/18713791.php and the new one as of November 2014 is posted below as well as a January 2015 addition, included the day after the City Council meeting where Mayor Lane gave special time to Police Chief Vogel to read his policy. An updated list of SCPD Officer names and numbers as of November 2013 can be found at http://www.indybay.org/newsitems/2013/11/01/18745758.php . Chief Vogel insisted at the January 13th Council meeting that he would not make this policy statement public It was, of course, available on video and audio–especially for those who (“illegally”) recorded it as I and John Malkin did. Vogel read off his description of the policy at the end of the Oral Communications period pmn 1-13 in the special time allowed by Mayor Lane apparently designed to deflect and calm the concerns of the largely anti-BearCat crowd that tried to speak. Vogel’s apparently created this “policy” without any input from critics or the community generally. It’s been included in the SCPD Policy Manual by Vogel’s fiat. With no dissent so far from anyone on the Council. Lane, however, did not allow the public to conclude its input nor invite any critics to express their concerns at that meeting. Nor did he direct Vogel to respond to questions about the supposed “deadline” date which he and Deputy Chief Clark falsely claimed required accepting the Bearcat before the end of 2014. Members of the audience who shouted out these questions were hushed into silence. Decorum, after all, must be preserved. Instead of marching to the police station, sitting in at the City Manager’s office, or taking other forceful direct action, SCRAM (Santa Cruz Resistance Against Militarization) deferred any protests, originally scheduled for the February 24th meeting. Food Not Bombs did not provide food at the event–which had previously been scheduled. The purpose of ducking the meeting seemed to be to avoid offending middle class police patrons who were attending a round of SCPD glorification with yet another memorial to former cops Baker and Butler. These two are well-known in the homeless community for their abusive behavior towards the poor. Meanwhile the struggle for the cash being collecting using the Butler and Baker deaths as fund-raisers is chronicled in the rapidly-shrinking Sentinel at http://www.santacruzsentinel.com/general-news/20150213/legal-battle-in-santa-cruz-fallen-officers-fund-extended-to-city . There is however, I’m told, a march against police brutality being scheduled by UCSC students on Wednesday afternoon from the Quarry to the SCPD station against police violence as oart ofthe 96 Hours of Action around tuition hikes and such. HUFF continues to urge a broader attack on local police abuse, as described at http://www.indybay.org/uploads/2014/12/13/flyer__for__12-17.pdf … http://www.indybay.org/newsitems/2014/12/04/18765028.php …and … http://www.indybay.org/uploads/2014/12/03/grand_jury_protest_updated.pdf . Sending back the BearCat and refusing License Recognition software as well as establishing an NDAA-free zone in Santa Cruz seem to sell more tickets than stopping the SCPD attacks on poor and minority people, demanding transparency from the SCPD, and dislodging the SCPD from its privileged position in the political process. For a reminder that I’m not the only one concerned about these issues, see “Police Injury of Homeless Man Still Unresolved” at http://www.indybay.org/newsitems/2015/02/18/18768736.php and “City Bicycle Program Dysfunction Continues” at http://www.indybay.org/newsitems/2015/02/13/18768472.php –stories suppressed by the Good Times but posted by writer Steve Schnaar. 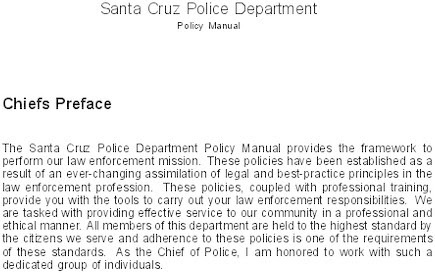 Schnaar has also written “Santa Cruz Police Department: Political Smears, Unfair Profiling, and Harassment” at http://www.indybay.org/newsitems/2014/12/28/18766107.php . The BearCat rescue vehicle is specialized equipment designed for specific purposes. The vehicle is not intended to be used for routine patrol or day-to-day operations. Only properly trained and certified personnel may operate the BearCat rescue vehicle. The Santa Cruz Police Department is obligated to make the BearCat rescue vehicle available to other law enforcement agencies upon request. Any request ofr use of the BearCat rescue vehicle requires review and approval from a police manager. In the event the request is approved, the Santa Cruz Police Department will provide our own personnel to safely operate and deploy the vehicle. Use of the BearCat rescue vehicle is restricted to those situations where the utility and capability of the vehicle are necessary and when the capabilities of other department vehicles are insufficient for those situations as determined by the chief of police or department designee. This includes, but is not limited to public safety emergencies, where life threatening conditions exist, the extraction of persons at risk, the need to insert police, fire, and emergency medical services into a dangerous environment, ballistic or projectile protection, high-risk vehicle stops, high-risk warrant service, active shooters, unsecured crime scenes. This policy recognizes that it is not possible to catalog or anticipate all situations where the BearCat rescue vehicles capabilities are necessary and/or appropriate. This policy acknowledges that it is not the intent that the BearCat rescue vehicle be used in an offense manner where no threat to the public or first responder personnel exists. such situations would include, but are not limited to parades and peaceful demonstrations where violence is not threatened towards the public, property, or law enforcement personnel. HUFF scurries to find out who’s being Stay-Away-ed under the new Drive-Em-Away-Without-Benefit-of-Trial law as well as discussing the Right to Rest bill and protests, the ever-looming attacks on Encampments, the Stay Away Lawsuit, those pesky Mosquito noise-making devices designed to drive away homeless “pests”, Recycling Ripoff–the City’s Latest Theft from the Homeless & the Community, & More–all doused in hot coffee or a beverage of your choosing!! Be sure to catch the homelessness marathon on 101.3 FM (freakradio.org) and other stations around the country, running from 4 PM PST Tuesday 11-17 to 6 AM Wednesday 11-18. Free Radio Santa Cruz will also have a session with Steve “Posturepedic” Pleich with possible long-distance call-in’s on the Right to Rest, the Camp of Last Resort, & Stay-Away’s. 6-8 PM Thursday at 101.3 FM and freakradio.org. Call-in 427-3772. Free Radio will be streaming and broadcasting the Marathon, Tuesday starting at 4 p.m. Pacific Standard Time. at freakradio.org and 101.3 FM. > poorest-of-the-poor, and featuring their voices as they speak for themselves. > (check local listings for exact hours of carriage). > Channel 348 on DirecTV. > unscheduled twists and turns). > is struggling, maybe it’s time to learn what the poor have known all along. HUFF reappears a its usual spot as the Stay-Away Orders begin….Review of the sorry City Council meeting; …Small Claims Demands Reach Council…Homelessness Marathon to Do It’s Annual Flurry from Florida Next Wednesday…and Recycling Rabbledybabble! Come, learn, and drink lots of coffee. Yo, HUFFsters! Sub Rosa won’t be open, so we’ll be moving to the Bagelry a block or two away (Cedar just off of Laurel). See ya there! 11 AM this morning. HUFFsters: If you’ve looked over the e-mails of the last week, let me know what you think. I’m wondering what we should focus on as an action this week. HUFF will, of course, be huddling Wednesday 2-4 at 11 AM at the Sub Rosa Cafe at 703 Pacific. Coffee and caffeinated tongues will flow freely! I favor prep for an action around STAY-AWAY’S (perhaps a protest to the staff or Terrazas’s Public Safety Committee), a follow-up on DISABLED DISPENSATIONS on Pacific Ave. and elsewhere, and/or SMALL CLAIMS COURT publicizing around the Sleeping Ban. Other prospects are a STRIKE 4 AT THE SCPD (demanding the release of Azua’s citations, so we can check racial categories), FINAL HOUSING FOR VETS (Becky’s proposal to unite anti-war, pro-vet, and pro-dignity-for-homeless sentiment by demanding a more local vet cemetary), SIMPLE HOUSING (some follow-up on Elisse/Raven’s proposal of last fall), VIDEO DEFENSE FOR THE HOMELESS (against violence and police harassment), VOLUNTEER OUTREACH (Major focus on getting more volunteers)… MAPPING THE MOSQUITOS I could go on and on. If someone wants to volunteer to spearhead this (Pat has been sick), we could add Cafe HUFF to any of these. Food Not Bombs continues to need volunteers–at its Saturday and Sunday meals 4-6 PM near the Main Post Office. HUFF fliers are there–and we need activists to sign up people for SMALL CLAIMS COURT there. As well as at the Monday Red Church meal 6-7 PM at Cedar and Lincoln. Sin Barras (the anti-prison group): Check their facebook page at https://www.facebook.com/sinbarras or sinbarras.org . I’m also including HUFF notes from the last meeting below. These are fragmentary and rough. Kip notes he sees vans and paddywagon mornings… Jacks seems them on Westcliffe now where not seen …harassing street performers waiting for their hour to be up…security guards and cops, Kip notes. Trying to get people to understand…. Cal notes Peaceful Warrriors Seminar in Berkelley on the 7th…for Direct Action…. Cal did a march fromFruitville to Oakland—MLK’s speech protesting violence–Oscar Grant… FNB, HNJ, Housekeys not Handcuffs…all peace…Chris arrives. PERFORMANCE PENS: How to properly demonstrate against the ordinance…need numbers–timing is important…shows on the 8th and the 15th who will be showing up to town….Wants to see the community too come out and exercise their right to ask for things…any request for anything…a Hug is considered aggressive panhandling–statement…sign cannot have a question regarding a request. Becky arrives.. Follow someone around with a camera….Brent said bathroom was totally clean… Getting together with environmenalists..
Elisse: 70% of the homeless born here or grown up here–removed from their homes by economic pressures. 1000 people: simple housing….for folks with debt–funded by … Becky says HUFF position is anyone moved around be given a motel voucher..
Ellisse asked why River St. Shelter people did gates etc.–so many drugs sold on the property–they couldn’t do anything about that… Janice notes they never tried to sell drugs to her… Janice–got to stop making people its permanent clients. I propose tabling and polling out there. Cal might be interested; Elisse will think about it. Cal has no car. Becky: HUfF position is calling for a nighttime carpark and campground. Janice’s Concern: JD Miini Storage and 41st Ave….with them quite a few years…Loitering banned, only allowed there for 20 minutes, no-smoking areas (she lit incense), pets in vehicle, hallway and unit doors must be open at all times…Janice harassed Only she got that letter…..management was there in a golf cart…she was looking at her fluids, considered “working on her van…” new management…Becky: they can’t put in new conditions……got letter last Saturday…..Becky and Janice may get together if Janice looks over lease with specifics. MHCAN Concerns–Sherry: positive people need ot be there so that outside problems in the neighborhood don’t happen…1051 Cayuga. across the street from the Fire Station on New restrictive proposals: …They’ll cut one of her days off and close off where they …people who give her occasional use permit– they were going to have a Board meeting on Monday but woman was sick…. Janice back 3 months and is still on the waiting list. Elisse wants to collect data on how many beds . Janice 61-year old woman having problems with mechanics..